I absolutely love Christmas and the entire Christmas season leading up to it. Admittedly, though, there are a lot of things that I do behind the scenes to make our picture perfect Christmas happen. Making lists is, for me, one of the essential components to ensuring a happy and peaceful Christmas for everyone, but especially for me. But where do you put all of those lists? In the past, I have ended up with scraps of paper here and there, notes on my phone, multiple notebooks (because I used whichever I grabbed first), and basically all of my plans scattered hither and yon. Last year, though, I created an all-in-one Christmas planner out of a plain notebook and I ended up having one the most enjoyable Christmases of my adult life! So today, I’m going to show you how I set up this year’s planner in hopes of inspiring you and giving you a little head start should you decide to make your own. AND make every subsequent year even easier since this year’s planning can just be used all over again. It’s easy to set up your Christmas Planner and to help get you started I’m going to show you mine. I had to take these photos before filling in the gifts section for obvious reasons :). I will be filling out my menus and adding more to my “to cook” lists and such in the coming week or so. If you’d like to see these pages once they are done you can follow me on Instagram by clicking here. At the bottom of the post you can see how I set up my table of contents and suggestions on these and other pages you might want to include. After you read this, I’d love to hear your other ideas in the comments! I have a lot of areas I like to decorate and it just feels so good to be able to put a check in the box beside each one so I can keep track of how much I have left to do. I also add a section for new decorations that I have purchased and how much I spent on them because I usually add a little bit each year and keep that within a certain budget. This page is VERY important to us because it contains all of the wonderful little traditions and things we cherish doing each year. If there are events in your area that you want to remember to go to, things you “always do”, this is where it goes. Hint: Save this notebook because you are also creating an heirloom for generations to come. So many treats, so little time! This list keeps me organized in that department. There are certain “must makes” that get repeated every year, such as those listed. I also add a few new things to the mix each year as well. There is plenty of room on this page to add whatever I need to. Note: This page is the list of things I’m making to give away as gifts. I have several things I’m going to add here but my friend, Rachel, pointed out last night that I needed to specify that this isn’t all of my holiday baking and treat making, just the gift treats. Each year I make out a Christmas budget as to who I am buying gifts for and how much I am spending on each person on my list. We don’t buy for many people outside of immediate family but this helps me keep up with who we bought for and if I went over or under budget. You can also add a budget sheet to your planner if you like, which would be easy to track with just a few columns. In case you missed it, I wrote a post a few weeks back with 10 Great Budget Friendly Gifts For Anyone that has some unique and useful gift ideas. I have a kitchen version coming up! These are for immediate family members, the ones I buy multiple gifts for at Christmas. I buy my Christmas earlier in the year (I finished shopping for this year a month ago) and this list keeps me from forgetting things I’ve purchased months earlier. 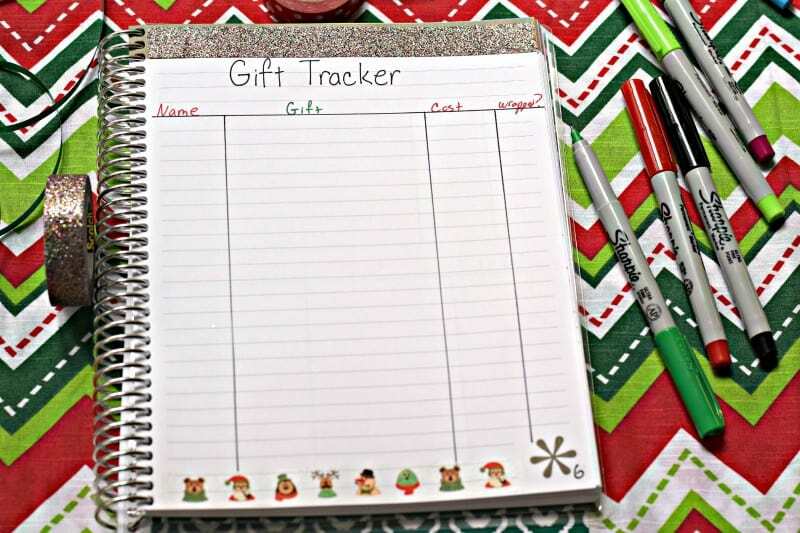 I also have a cost column to keep me in budget and a check area for after the gifts are wrapped and put under the tree. One of my favorite spots are “stocking”, “looking for”, and “to do” for each person. This is where I really enjoy personalizing and seeing what fun surprises I can come up with. 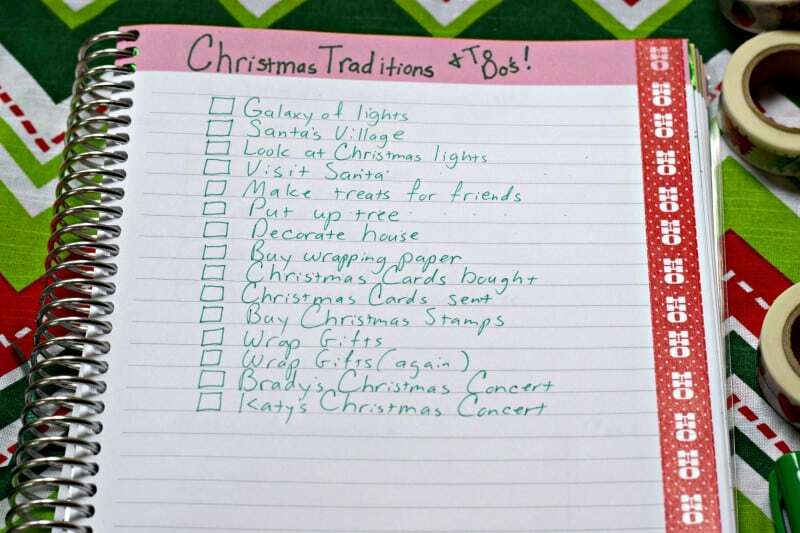 Here are Brady and Katy’s lists. I’m happy to report that these are all filled in now! I try to keep a well stocked pantry of holiday ingredients around Christmastime and limit my outings to the store as much as possible due to the craziness and crowds. I start early writing up a list of items I know I will need and add others to the list as I select more recipes. By keeping this in my purse at all times during the season I have an ongoing list of things I need to buy with me at all times. Christmas Eve and Christmas Day are big doings at my house and although they both constitute a lot of work, it seems infinitely easier if I have a list so I don’t have to spend half my time trying to remember what I’m supposed to be doing next or fretting over whether or not I forgot something. I like to make as many of my dishes ahead of time as possible so a little check off list helps me see what else I have to make. This also prevents me from forgetting to put something on my menu out and discovering it long after the meal is over – something that has happened all too often in the past! What are you cooking Christmas day? What do you need to get for the meal? Is any of it made ahead of time? What do you need to do to prepare? This page covers all of that! I’ll post a picture of this page once the menu is filled in on my Instagram later this week or next week. Lastly, I make a table of contents. My book is ever growing because I add more pages as I find them necessary, so this is more of a living table of contents. If you go back and look you’ll notice I put a page number in the bottom right of each page. I then come back here and list them along with their numbers for easy referencing. Any notebook will do for this but this tutorial features a notebook from Erin Condren with a customized color. If you want to go this route, click here and sign up for their email list to get a code for $10 off. They will send you 3 emails and the third one is very important: 1. a confirmation email (which you have to read and click a link to confirm), 2. a welcome email, 3. and then an email with a code for $10 off your first purchase. All of these emails come within about ten minutes. However, you can use any notebook you like. I’m just letting you know in case you wanted one like I have. The custom cover is included in the price of the notebook. *My notebook cover is Mod Morocco in custom color way jade+red. Fine Point Sharpies or other pens of your choice. I like to use colored ones to keep it seasonal and fun. Christmas Washi Tape – this is a decorative tape that I put around the borders of some of my pages. You absolutely don’t have to do this but I had it handy so I used it. Washi tape may be purchased at any arts and crafts store in the scrapbooking section. You can also find some cute Washi at the Dollar Tree if you are lucky and figure out where your particular store has placed it for display. Ruler – I use a simple ruler to draw my lines in order to keep them straight. That’s it! 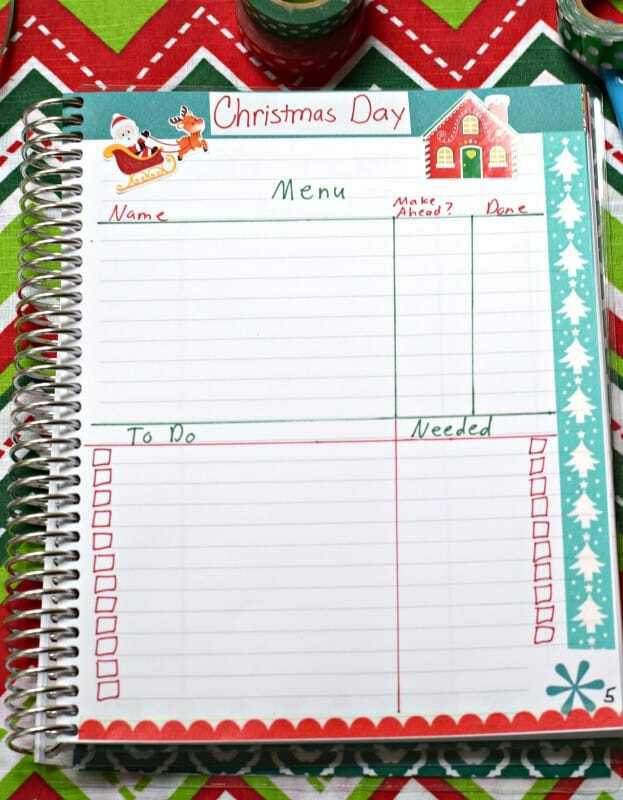 With a little thought and about half an hour of my time I’ve created a customized, ultimate Christmas planner for my family that will be useful to me for years to come and become a cherished heirloom after that! In the comments below, I’d love to hear what pages you would add to your planner or what other pages you think will be useful. Inspire us! If you find this post useful, please share it to your Facebook and Pinterest boards. Thank you so much! Old Fashioned Peach Cobbler – nothing like it! Oh this just makes me so happy!! I LOVE lists! A couple of suggestions; 1) An actual Chistmas card list for sent and received. 2) A list of who attended each gathering, following the menu. I hope these might be helpful. I keep the Christmas card sent and received list. (especially as postage in Canada is now $1.00 a piece. ) My family is growing now, so I will keep track of who attends the functions. I love the idea of covering the journal etc. with the Christmas tape. I also keep a red file folder with all the recipes for the season. Merry Christmas!! I am such a list maker, but sometimes I get overwhelmed. I love this idea and think I will start making notebooks for holidays. I use them to make my grocery lists and random thoughts and have them stashed everywhere – my purse, night stand, car, work. Thank you for the more detailed idea. Thank YOU for taking the time to read Alicia! I’m so excited that you found it helpful! We take pictures of things (seat set up, cookie platter, trees, etc) to make sure we remember “how did we do it last year?”. This could go on back pages or in photo sheets if someone uses a binder. Polaroids worked great when they were around. 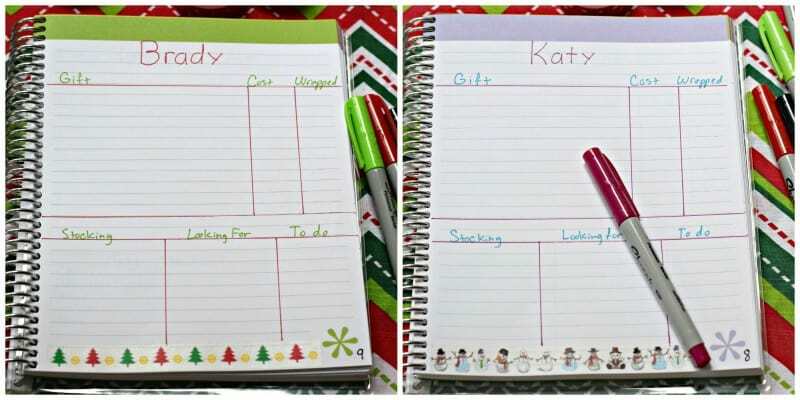 Now you would have to remember to print the pictures and put them in the notebook book. Also, do you just keep the same book and add to it each year and then when it is full, start over? Great idea Becky. We always go thru the “was it last year or the year before that we . . .”. When we take camera photos I particularly want to save, I take an additional one on my phone. That way I have it and print whenever. I am going to keep the same book. I have the book from last year but decided to upgrade this year. My mother uses the same book each year as well. If you check the boxes – do you make a new page for the next year? Or just a new check off box? When taking those pictures (and of the kids too) use a 8×12 piece of paper and include the year in numbers big enough to cover the page and have that included in the picture. This helps you remember the year and event. I think I would add “Thank You notes to Write” as the last entry. I am an old fashioned southern gal. The full page is blank when opened online. I have to go to the “View this mail in your browser” and it takes me there. Is this the way it is supposed to do? I’m not sure what you mean by “the full page”. If you are opening the email in your online email program (maybe thats what you mean?) you might have to click “display images”, depending on which program you are using. There are so many of them out there that it is hard for me to offer one solution that will work with all of them I’m afraid. This would be a great gift for newly weds. I started a notebook like this eighteen years ago. My go to book for every Christmas. 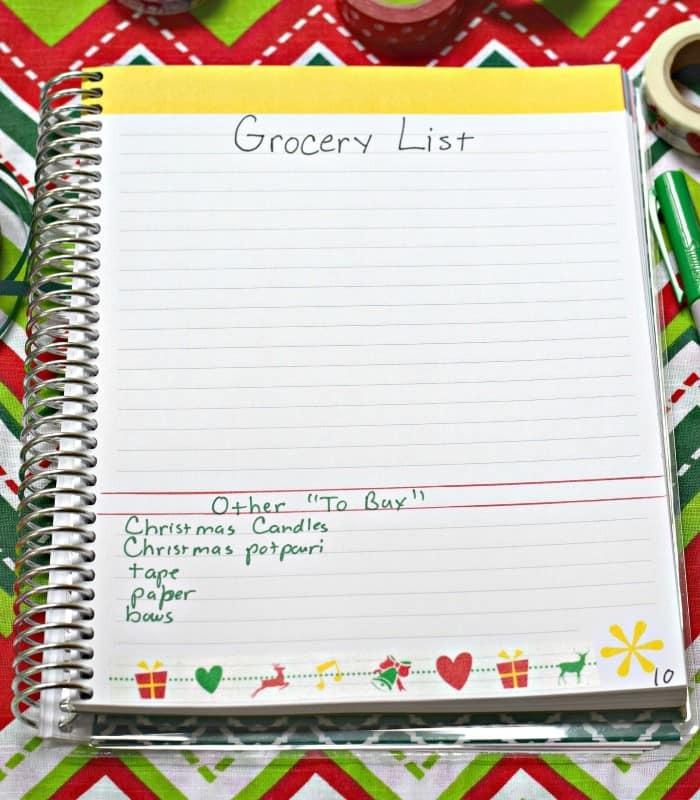 It includes menus/recipes/grocery list/gifts and addresses. It is fascinating to look back at old gift lists from past Christmases. I would frankly be lost without it. No house should be without one. What a magnificent website you have. I just love Southern food and your recipes are just “down home goodness” ! I am a “Southern Refugee (East Tennessee, Knoxville) living in Arizona”. I adore southern cooking and your recipes just bring a bit of the “good ole South” to the dinner table. 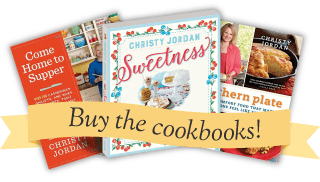 I know it is a lot of hard work to create these Southern Gems recipes, publish cookbooks and do videos, but we really love it here! Thank You sooooo much ! You are an “Epicurean Genius” in the kitchen!!! God has truly given you a gift for making wonderful food and thanks for sharing; we appreciate it very much!! Although we may never meet, I feel like you are family!! By the way, I was stationed in Pensacola FL when I was in Aviation Officer Candidate School. We went to Mobile AL all the time, best Pulled Pork Sandwiches on the planet. I don’t know about “genius”, but thank you Dave! You sure know how to make ones day!! May God Bless you and yours as well!! I think this would work for family weddings too! Son and his Sweetheart want to have their wedding out here on our farm next summer and Good Gravy! This is way beyond my limited experience and with money not growing on trees an’ all- it’ll be a DIY event. And hey, if you have food and food safety suggestions for a July outdoor wedding reception in the rural South, please share! I'm thinkin' we're going to need a LOT of ice. I also have where each recipe is located. If it’s in my 4×6 recipe box, which cookbook, etc. Then, I know what location the recipe is, and saves frustrating moments. Also, if someone wants the recipe I can grab the book open it, and hand them paper and pen. Also, I combined staples quantities. If I know I’m going to need 6 lb’s of butter, I can mark it off when that quantity is purchased. If I’m storing it, which cabinet or freezer etc., I put it. This may sound overkill, but it’s easier to tell someone to go to the cabinet by the phone to get the whatever than have them hunting for it. I try to keep the locations minimal but sometimes life happens. Great ideas Sue!!! Thanks for sharing your tips on making the holidays easier!! What a neat and helpful tip on the notebook planner. I am doing Christmas this year and this will be helpful. I have not done Christmas’s in a few years, since my fathers passing a few years ago on Christmas Day. It really ruined Christmas for me, and took away all my Christmas Spirit. I felt guilty for my two sons and grandsons, although I think they understood. Its time to get my Christmas Spirit back and still keep all of my fathers memories close at heart. 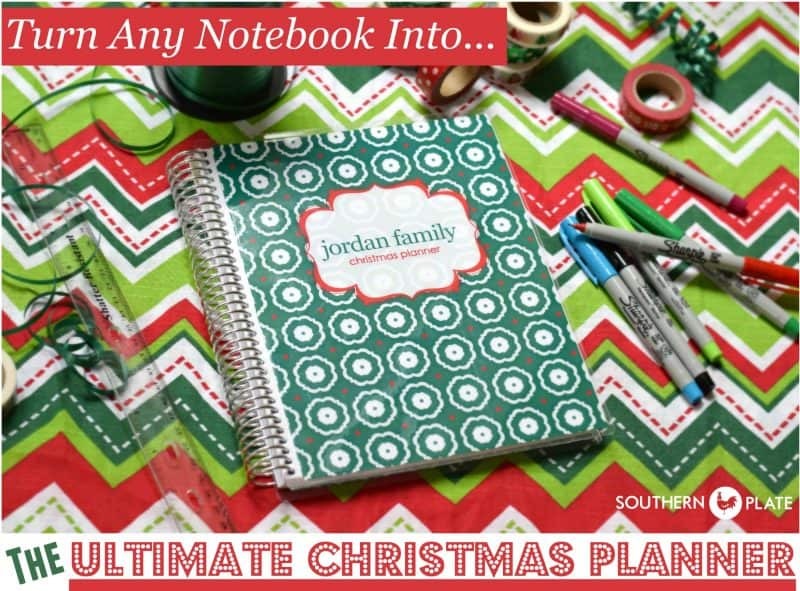 So your notebook and planner will give me some new ideas at helping me celebrate Christmas and the true meaning of Christ’s birth and my wonderful family which God has blessed me with. Thank YOU Christy, for all your wonderful tips and recipes. May you and all your family have a wonderful Thanksgiving and a very Blessed & Merry Christmas. I cant wait to see all your new upcoming Christmas recipes along with some of our old time favorites..
Blessings to you and yours Pam!! I hope you have a wonderful Christmas and enjoy those grandbabies! I like to keep notes about which table settings I use each year so I can use different colors of table cloths etc. the next time. After 45 years of marriage, I have quite a collection of nice cloths, placemats and plates & glasswear, chargers, etc. I have a separate table for the grandchildren [ 8 under age 10 ]. I like to buy the holiday paper placemats they can colour before dinner is ready. I buy little favours for both the adult and children’s tables – things from a discount store. I also love lists and organization ! I have many years of Thanksgiving & Xmas menus I used . I like to try new recipes as well as old favorites. Happy Holidays ! Oh, I love the idea of the placemats that they can color!!! Thanks for sharing Lucy!! 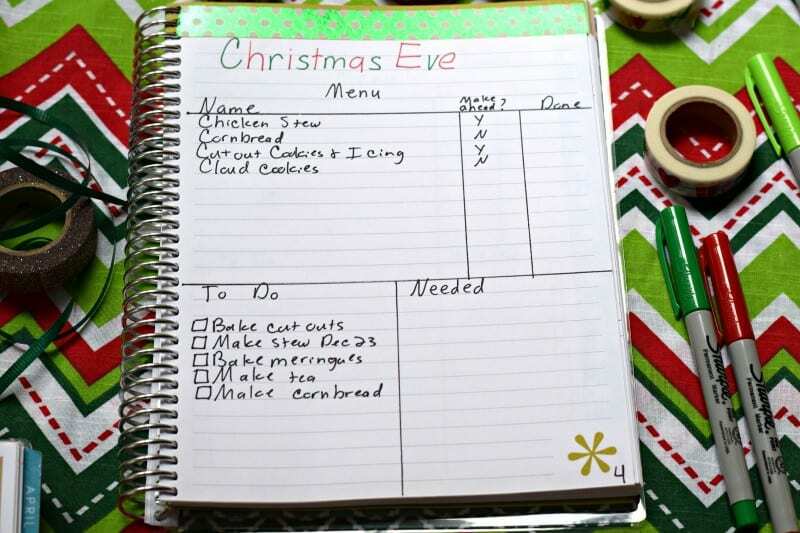 This is a really neat way of helping one stay on track with the holiday planning. I usually have pieces of paper stuck here and there, then end up digging through kitchen/dresser drawers trying to find the pieces of paper when I need them. This inspires me to get my notebook together and do it the right way, organized! Thanks for sharing!! I am so glad it helped Lisa!!! Great ideas. I love your site. I also keep a notebook but I love using dry erase boards. I keep several ranging from 10×15 to 6×9 by my ‘thinking’ chair and a super large one on the wall. My plans evolve and I love the flexibility they afford. One will be a house cleaning schedule, one a cooking schedule. One will plan that day in detail while one may be random thoughts. You get the idea. Plus, my vision isn’t as good as it used to be so I like to see without straining. Also, I like to document each year for reference the next. There is an app that I love for keeping up with the Christmas gifts. It is called Santa’s Little Helper. I’ve learned the hard way to ALWAYS notate where I hid the gift after I bought it and I check each one off when I wrap it. I also make lists and notes everywhere. 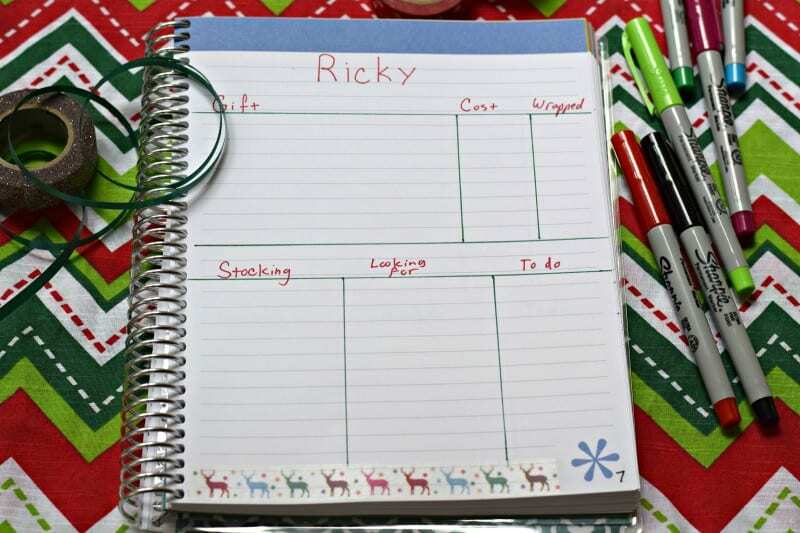 This is an awesome way to keep things organized and all in one place. This has given me the push that I need to make a notebook. The one thing I will add is a page for clothing size for each member of the immediate family. At Christmas time, I have little pieces of paper in my purse with jeans, shirts, etc. sizes. Thank you and I also love your recipes. I just made mine! This is a great idea. I used my computer and printer to make a paper notebook cover with our family name and slapped some tape on it. Done! There were some holiday templates in my computer program that were free and easy to type in. A one subject notebook with an inside pocket to tuck away the cards I buy worked great. 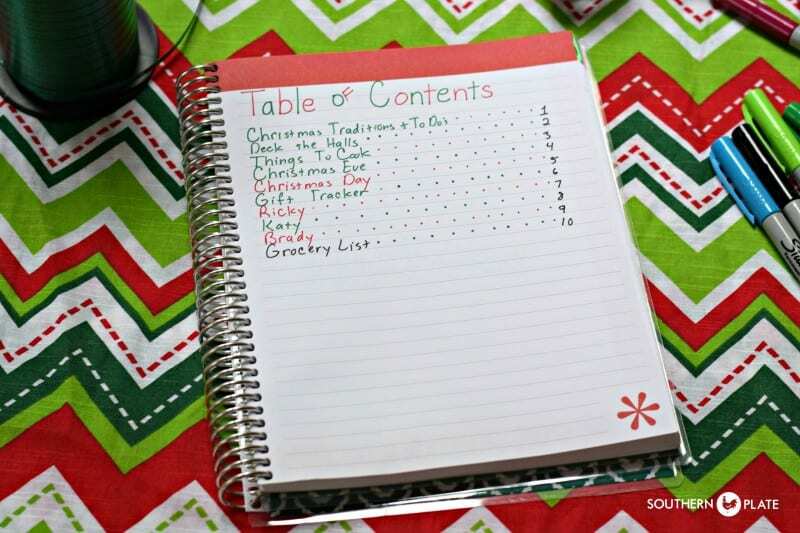 Thank you for sharing this great way to organize the holidays. I will use this for many years to come. 🙂 It also prompted me to google holiday events in our area and learned we’ve been missing out on some parades and such. Thank you again! I hope you have a wonderful and organized Christmas Julie!! I have Christmas notebooks from 1960-2015. Not as detailed as yours though. Mine are Christmas cards sent, Christmas cards received. Gifts given and received and a budget page of money spent for gifts ,stocking stuffers and such. My favorite page is the memory page where I just write about the day. It’s fun to look back. Oh my goodness, what a great way to look back on your family memories!! That is awesome! I always feel I need help prepping for Jewish holidays. This will help a lot! Thank you! Great idea Michelle, it is so versatile that it could be used for any holiday!! Thanks for such a great idea! I, like others, find myself with various lists here and there, then wonder where this list or that list got off to! Ha-ha! We attend several Christmas gatherings each year where small ($) gifts are exchanged. Throughout the year, if I see something I think would be appropriate for one of these or for a stocking stuffer, I pick it up. On more than one occasion, I have run across one of these after the season. 🙁 I will add a page to my notebook for these “unspecified” gifts and their cost so hopefully that won’t happen again! I don’t see a place to unsubscribe to your site. Can’t wait to start our Christmas notebook. Now that we are Nana and Pop, we spend more time traveling to the grandchildren, ages 2 and 4 months. I nearly went crazy last year with Thanksgiving dinner, mostly made ahead at home and taken 3 hrs north. I can include pages for plannin’ and packin’. I cannot remember who said it but it was a wise person…. Grandparents must remember “it’s not their turn anymore”. We need to be the flexible ones….. Love your site Christy. I hope you enjoy your Christmas notebook and your time with the little ones!!! So many folks would come up with great ideas like these and keep them to themselves. Thank you so much for being willing to share not only your ideas, but your heart and soul. I appreciate you so much for being a “real” person, true to yourself, and including us in your thoughts just as if we were old friends. You are much loved! Thank you so much Robin!!! Love you too! We are so “sisters!” I am 70 years old and love the entire holiday season! I have been doing virtually the same thing for years and years. I use a binder and notebook paper. I have sections for Thanksgiving, family Gift section, special phone numbers I need during the holidays, baking section with dates I anticipate baking each sweet or savory item, gift sections for other family members, one for special gifts for friends, a page for gifts for all family pets, calendar pages for October and November where I try to keep track of all important ( and not so important) events, Christmas Eve plans including a menu for the day and last but not least a page for Christmas Day including a special breakfast meal and lunch and dinner plans. My husband makes all types if brittle for family friends and this year I have added a section for his gift bags of brittle and who and when they will be delivered. I use notebook dividers in my binder. Believe it or not, I have worm out several notebooks! I also have a special bag that I keep the notebook in and it is hidden when I am not using i. More than one person has tried to find MY SPECIAL CHRISYMAS BOOK over the years, but I do not think they have ever found it. Thank you for your special post. Oh my goodness, so many wonderful tips Virginia!!! Thank you so much for sharing! What a lovely idea. I used to do this before I got sick. I have always been the one in the family that loved to cook, bake, host, shop and decorate for the holidays. I looked forward to the hustle and bustle of getting everything just perfect so that my children would have the Norman Rockwell Christmas that I believed they just had to have. In 1998, I developed Lupus, Fibromyalgia, Heart Failure, PCOS, Hashimoto’s Disease and the list goes on. I deal with excruciating pain every day of my life and experience extremely low energy and fatigue. Regarding everything in my life, especially holidays and special occasions, I have had to cut my expectations and involvement way down and give up so many of the things that I loved to do to make Christmas memorable and perfectly special. I still have the desire to do everything in your beautiful, thoughtful book, but the reality of my illness grounded me from my picture perfect Christmas. At one point, I was angry, sad, disappointed and even jealous that I couldn’t participate in all the ways I wanted to for Christmas like “normals” could. However, my bad behavior was ruining Christmas for me, for everyone. I was stealing the joy that God offers us through the extraordinary birth of his only son. I knew I had to check my attitude at the door, and with God’s help, I finally choose to accept my limitations, lower my expectations and focus on giving my family a rich, but more manageable Christmas. I don’t pressure myself to send Christmas cards and I now shop online. We decorate a tree, set out my small Santa collection, put a wreath on the door and hang our stockings. I am so glad you found your balance and quit allowing “expectations” to diminish your joy Sherry Lee!!! My family has grown so that we now have to share the kids and grandkids with other grandparents. This changes things for the holidays. We alternate Thanksgiving and Christmas each year, making sure we have all of ours together for at least one holiday. We don’t always have the same menu for our meals, sometimes we have a theme. I travel a lot to other countries and we will sometimes have dishes from that country. After going to Antarctica, which was my last continent to visit, we decided to have a dish from each continent. We couldn’t think of a dish to represent that continent so we had ice in our sweet tea from Antarctica. I wish I had kept a notebook of all the different themes, my memory isn’t that good. This is a beautiful way to keep organized. Thanks for the ideas. I LOVE your Antarctica “dish”!!!! What wonderful memories!! Hi Christy, love your suggestions! I’ve kept a Christmas book for years and it’s fun to go back and see what the “kids” got from Santa when they were little. My youngest is 33 now! One thing I do that I find really helps with the next year is I save a page or two for a “recap” of each Christmas. 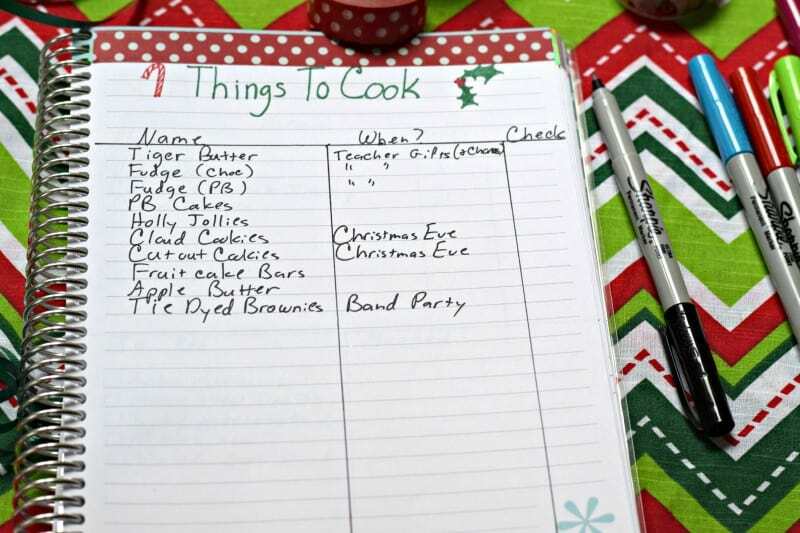 Turkey sizes vary, cookie lists change, party ideas succeed or fail, decorating ideas to be saved, new recipes to be continued or not and great ideas to be saved for next year. It also helps with not duplicating gifts from year to year. It seems holiday decorations come out before Halloween and this helps me remember that I need crackers or candles for the upcoming Christmas so if I see what I need is on sale I can pick it up. It’s a beautiful season. Enjoy! Ohhh, I love some of your ideas as well Diane!! Christy, I have to say I LOVED this post! I’m am a huge fan of making lists-they keep me sane! I keep my lists in my planner (which I jokingly refer to as my “baby”!) LOL! 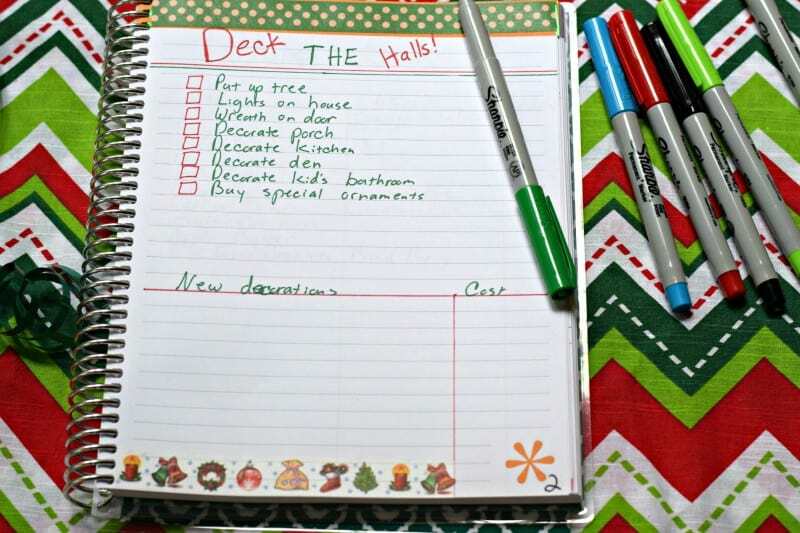 The holidays are stressful enough without having to think of stuff being un-organized! Love your categories too! Great job!